Michelle Hobart received her laurea in medieval history and archaeology from the University of Siena, Italy, an M.A. in medieval architecture from the Courtauld Institute of Art in London, and a Ph.D. in medieval architecture from the Institute of Fine Arts, NYU. Her studies on the archaeology of medieval Mediterranean focus on Sardinian religious architecture and its material culture. She has also worked on numerous excavations in central Italy, as the co-director of the University of Pennsylvania field school at San Pietro d’Asso (Siena, 2010) and currently director of the SUNY-Buffalo project at Capalbiaccio (Grosseto). 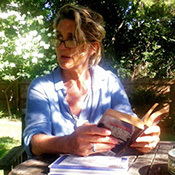 Her recent and forthcoming publications include: A Companion to Medieval and Modern Sardinia (editor/contributor, Brill, 2017); the final Archaeological Report of Frontier Castles in Southern Etruria: Capalbiaccio/Tricosto (Grosseto, Italy, 1976 - 2010) as editor/contributor, SUNY Press, 2017; “Monasteri contesi nella Tuscia Longobarda: il caso di San Pietro ad Asso, Montalcino (Siena)” in Archeologia Medievale XVIII (2011); and “Merchants, Monks and Medieval Sardinian Architecture,” in Studies in the Archaeology of the Medieval Mediterranean (Brill, 2010).